A foot and one-half of snow in Arizona? Snowbirds, is it really warmer here than back home? And who left the deep-freezer door open? Brrr. Arizona is in a short spate of cooler temperatures than we’re accustomed to. 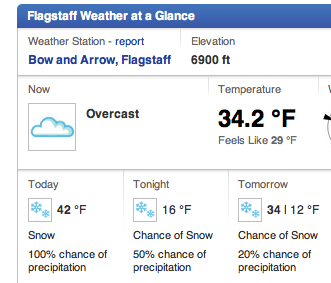 Flagstaff has between one and two feet of snow and even cooler temperatures than ours. No one was warm at Debbie’s team tennis match this morning despite propane heaters over the spectator area, extra blankets for us to bundle under, and sometimes finding a place out of the persistent wind. Oh, and it was raining off and on throughout her match. The players continued pluckily, aided by the synthetic grass court service which seems a bit tractionless even in best of conditions. Our weather forecast for tonight is 36 degrees and our high for tomorrow is low 60s and no precipitation. Just think, this would be balmy weather for Canada. We had to laugh whilst in Vancouver BC over the Christmas holiday — the weather announcer on CBC read off all the sub-zero temperatures throughout several provinces and then stated “and balmy Vancouver will be up to 8 degrees” (Centigrade). Yeah, that’s balmy compared to the rest of the nation. We know we’re very spoiled — daily highs range between low 60s and high 70s throughout most of the winter in Mesa AZ. So when a day fails to get up to 60 we think it is a really cold day. Give us a day in the high 70s and we are forced to the outdoor swimming pool to catch some vitamin D and maybe a tiny bit of tan for our very white tennis feet. And if the weather reduces our ability to find 75 degrees anywhere, we’re outta here. Isn’t this why we’re full-timing? We hope you are warm wherever you are, have not too much snow to shovel, and have a lovely Valentine’s Day. We thought full-timing would give us hope of better weather more often. Instead we, like everyone else, settle for what we can get. Sometimes we’re in really cold weather. This past summer we enjoyed a fairly typical hot muggy summer in North Carolina. Snowbirds from all over the continent migrate to Phoenix and Mesa Arizona for the mild winter weather. This time last year we were facing rolling blackouts because of unexpected high electrical demand from very cold temperatures. We’ve had our weather ups and downs over the past year. Until this week — this is the weather we’ve been chasing for four years. You know you're in the right place when . . . Thanks to www.weather.gov for this picture and the warm sunny forecast. You might think we’re avoiding 75 degrees, instead of chasing it. We seem to repeatedly stop in chilly places. In fact we would not have guessed we would stay so often in places cooler than 70 or 75F degrees. We really aren’t trying to find cool weather but our travels sometimes lead us to great places temporarily cold. Our Minnesota visit was lovely (hmm, less warm now) and our Tim Horton’s Trans-Canada Tour was mostly very comfortable, temperature-wise. Vancouver, B.C. was right at 75F degrees most of the time we visited. Everett, Washington was nice and warm in early October with highs in the 70s when we left for Idaho. Our first night in Idaho, just north of Boise, was snowy and we didn’t see another warm day until we arrived a few weeks later in Mesa, Az. Six weeks of great Arizona weather spoiled us — bright warm sunny days, nice cool nights, a little rain every week or two. 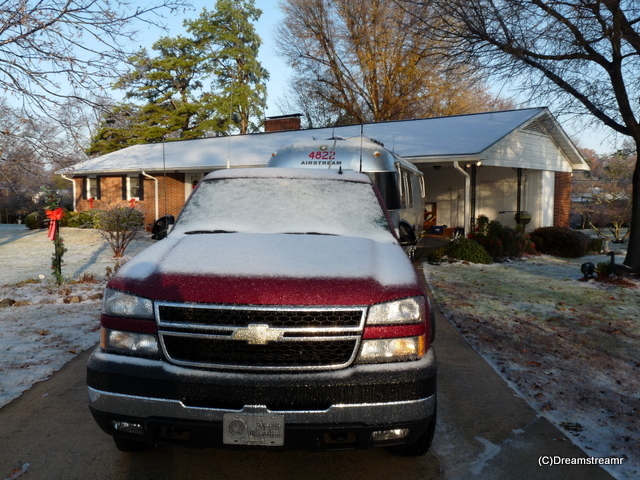 Our traveling weather from Mesa to Kannapolis was fine, too, but not warm. 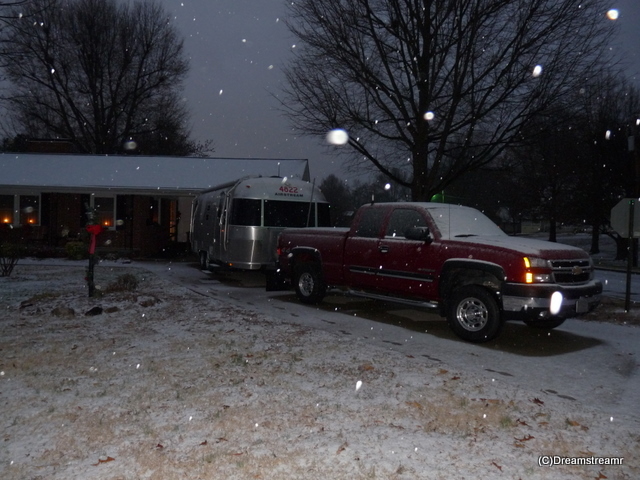 We arrived in Kannapolis just ahead of a great winter storm. We had briefly a nice snowfall yesterday, followed by sleet and freezing rain. The high temperature yesterday and today is 39 degrees, and we saw freezing last night. Boy are we glad we skipped driving on Friday — we wouldn’t have wanted to drive in the winter conditions. We stayed in Idaho to see friends, to explore a little longer, and to see the Sun Valley Jazz Festival. Snow, ice, and very cold temperatures made it all the more interesting. We were, on our way to Mesa from Ketchum, Idaho, going to linger in the Glen Canyon and Grand Canyon areas. But the weather and temperatures were just TOO interesting, and we didn’t want to winterize our home while living in it. We’re not trying to find cool or cold weather, it just happens this way. Our next travels, we think, will again take us to warm weather. Until then, we aren’t here for the climate anyway. We’re here to celebrate the season with family and friends, no matter the weather. We’re still chasing 75 degrees, when more important matters allow.